Mark your calendar! Paws n’ Hearts is only a month away! 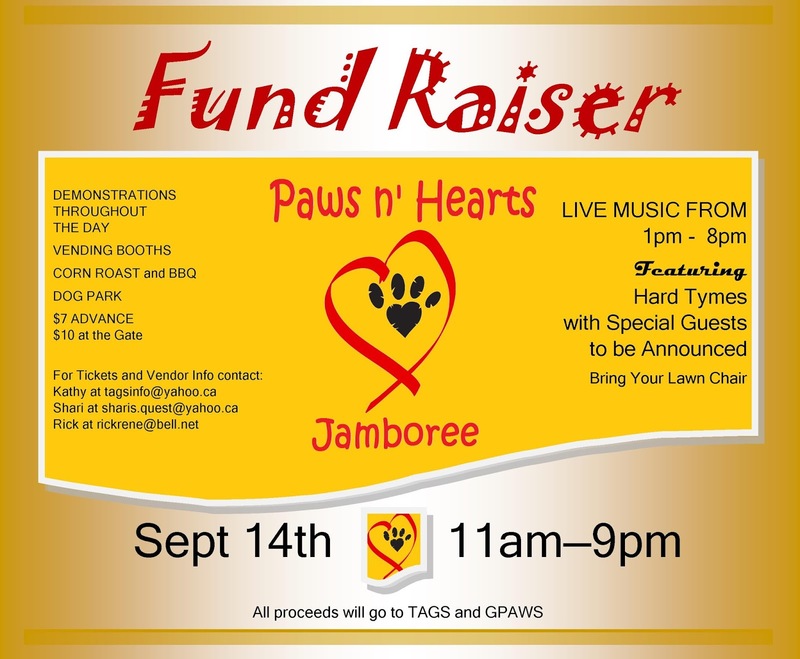 What is the Paws n’ Hearts Jamboree? 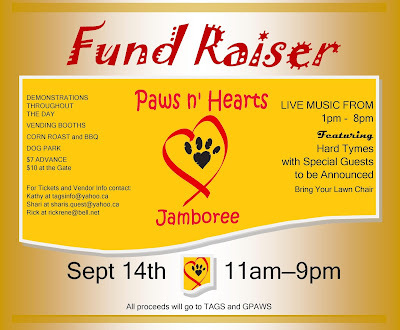 It’s an outdoor fundraiser hosted by TAGS in partnership with Guardians Promoting Animal Wellness (G.P.A.W.s). All of the money raised will be used to support animal rescue initiatives. Advance tickets are $7.00, and tickets at the door are $10.00. Of course! This event is all about dogs, after all. 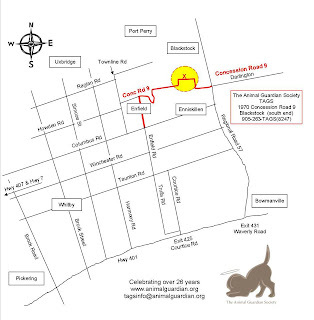 The event site includes a fenced-in dog park, but we ask that every person supervise his or her own dog or arrange for someone else to do so. In other words, no dog should be in the park without supervision! Paws n’ Hearts is being held at the TAGS dog park. Listen to live entertainment from three different musical groups throughout the day, including Hard Tymes and The Winter Vault. Make sure you bring a lawn chair! Watch demonstrations in between musical sets from G.P.A.W.s, TAGS, a local groomer, and more! Bid on items in the silent auction. Participate in the 50/50 draw and other contests running throughout the day. Play doggy games with your furry friend(s). Eat! (There will be burgers, hot dogs, chips and drinks for sale for $5.00). 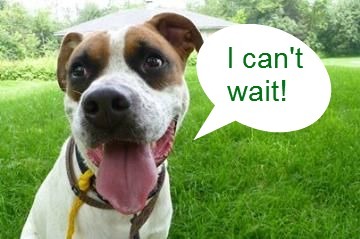 Browse vendor booths and purchase items (not all are dog-related, so there will be a big variety)! Dexter is excited for Paws n’ Hearts! I want to be involved! What can I do? We will be accepting donations for silent auction items or door prizes until Monday, September 9. The more items you are able to contribute, the better! This way, we will be able to raise more funds to allow us to continue to do our rescue work. Volunteer! We need people to help supervise the dog park, sell draw tickets, handle cash at the BBQ, and assist with setup and take down of booths. Spread the word! Join our Facebook event and let everyone in your social circle know what you’ll be up to on September 14. The more, the merrier! Yes! 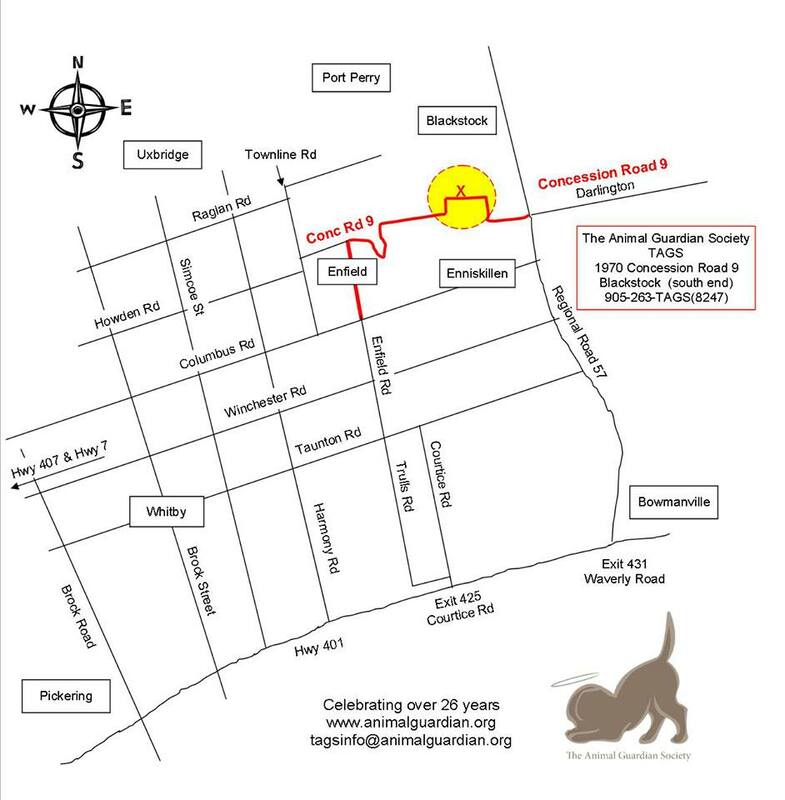 The cost to set up a vendor booth at Paws n’ Hearts is $25, and there will be room for two or three people per booth. Remember, your business does not have to be dog-related. It is likely that Paws n’ Hearts will be a cash-only event. Please plan accordingly because there are no banks or ATMs near the TAGS dog park. For tickets and vendor information, contact Kathy (tagsinfo@yahoo.ca), Shari (sharis.quest@yahoo.ca) or Rick (rickrene@bell.net). For other information, please ask in the comments!